The January Gallery is up over at Write.Click.Scrapbook.! This month's theme is The Times. In other words, how our daily lives are affected by the current culture. This kind of layout is always fun to look back at after several years have passed. I chose to chronicle some TV shows we added to our line-up in 2013. Phil started watching Duck Dynasty while recuperating from the flu. I got us hooked on Downton Abbey when I ordered the entire series on DVD. We don't remember why we started watching The Big Bang Theory, but it's our favorite right now. Quite an eclectic mix! You can find more inspiration from the rest of the team right here. Good topic to kick off your scrapping for 2014! Love this page and topic, Sue! The banners look awesome with the tilted photos and journaling strips. Happy New Year! Lovely page! I made a LO of current favorite TV shows like that last year. It's one of my favorites. Jillibean Soup had a line called Macho Nacho that featured lots of TV motifs and was just perfect for that page. I didn't include any photos though, that is a fun idea! Love the neutral background and the pops of color. Great page, clever topic. Michelle t.
Wonderful topic for a page. Love the big banners and having the photos in b&w. We have the same taste in TV. Big Bang is my husband's favorite and I got hooked on Downton via Amazon. Looking forward to next season this Sunday. 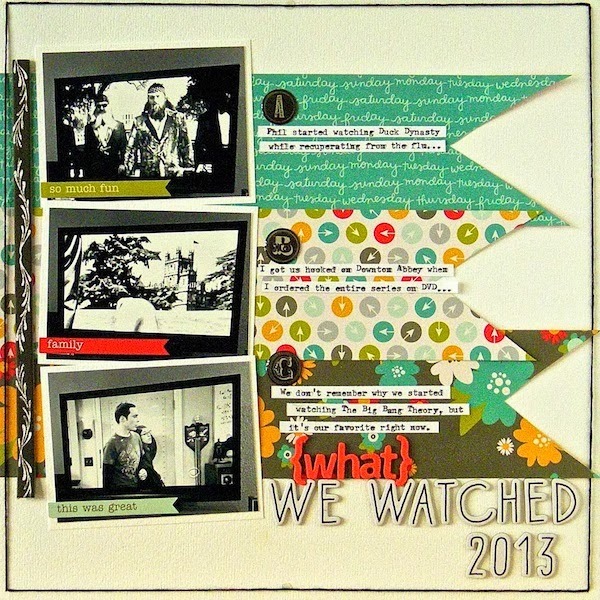 Awesome layout Sue and I love the idea of documenting some of your favorite shows!! I absolutely love your layout design and the subject matter is so fun! We catch Duck Dynasty every once in awhile. They are a hoot. I haven't seen Downtown Abbey, but I hear it's a must see. And we have watched the Big Bang Theory since the beginning! Love it! Another fun layout! And such a fun idea. We just got hooked on watching "Breaking Bad" over this break and it is quite addicting. Also, love Big Bang! I got my BIL a Big Bang Trivia Game for Christmas. Anyway...I love this idea and your layout with the large banners is eye-catching. Love the journaling with your typewriter.